Thank you to InstaNatural for providing the peppermint essential oil for today's post. As always, all opinions are my own. 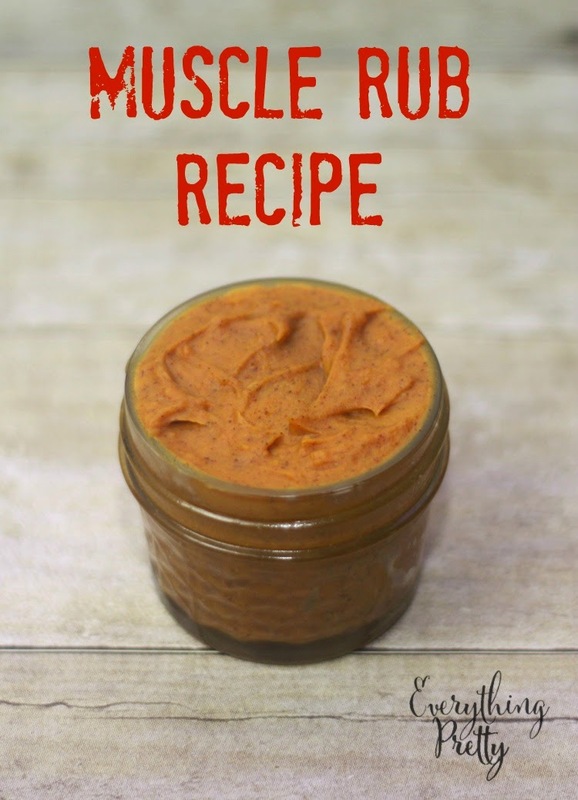 My husband has a bad back, so I made him this homemade muscle rub recipe to help him while he goes through treatment. It warms slightly when you apply it to your skin, and it's just the right consistency for a gentle massage while you're applying it. I carefully selected each ingredient, so read on to learn how they all work. Links in this post may contain affiliate links, which means that I earn a small commission from sales. Coconut oil is used as a lotion base, and it gives this recipe a longer shelf life than using water. Beeswax helps harden the cream. Ginger can have anti-inflammatory properties. Turmeric is also said to reduce inflammation when applied topically. Peppermint essential oil naturally relaxes muscles and can dull pain when applied topically. Arrowroot powder is added to reduce the oiliness of the coconut oil. This is an optional ingredient. I used turmeric because it is anti-inflammatory and it's said to relieve mild pain. However, turmeric will stain most things it touches yellow, so use old utensils or at least not your best wooden or plastic ones. It will also turn your skin slightly yellow, but it will wash off. I would not recommend wearing your favorite piece of clothing if you used turmeric. Add beeswax pastilles or grated beeswax to a 2 cup Pyrex measuring cup. Microwave on high at 30 second intervals and stir between microwaving. Mine took two 30-second intervals and another 10 seconds. Add cayenne pepper. Add turmeric or ginger. If you use turmeric, be sure to use metal or old measuring spoons so they don't stain. At this point, you can stir by hand or use your mixer. I used my mixer because the spices will sink to the bottom. I also added some arrowroot powder to cut down on the greasiness. Spoon in to a jar.